Long ago, there lived a lion in a dense forest. One morning his wife told him that his breath was bad and unpleasant. The lion became very angry and got embarassed to hear this comment. He wanted to check this fact with his councillors, as well. So he summoned them one by one to his court. "Hello friend sheep," said the lion, opening his mouth wide, "tell me, if my mouth smells bad?" 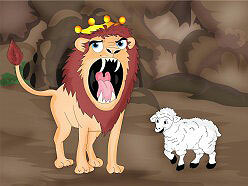 The sheep thought that king lion wanted an honest answer from him, so he said, "Yes, Your Majesty. There seems to be something wrong with your breath." This plain speak did not go well with king lion. He pounced upon the sheep, killed him and ate him. Then king lion called the wolf and said, "What do you think? Have I a bad breath?" The wolf knew the fate his colleague, the sheep, had met. He wanted to be very cautious in answering a royal question. So, the wolf said, "Who says that Your Majesty's breath is unpleasant. It's as sweet as the smell of roses." When the king lion heard the reply he roared in anger and immediately attacked the wolf and killed it. "The flatterer!" growled king lion. Finally, came the turn of the fox, who was lion's third councillor. When the fox came, the lion asked him the same question. The fox was well aware of the fate of his two colleagues. So he coughed and cleared his throat again and again and then said, "Your Majesty, for the last few days, I have been having a very bad cold. Due to this, I can't smell anything, pleasant or unpleasant." The king lion spared the fox's life.